Similar to Turkey, Sri Lanka suffered from terrorism for decades, and after successfully eradicating terrorism, the country has built a new Sri Lanka. Ambassador to Ankara Pakeer Mohideen Amza discussed with Daily Sabah what Turkey could learn from Sri Lanka's fight against terrorism. Amza said that the three pillars on which the new Sri Lanka is being built are democracy, development and reconciliation. Underlining that there is no good terrorism, Ambassador Amza expressed his confidence that Turkey will soon eliminate terrorism from its soil. 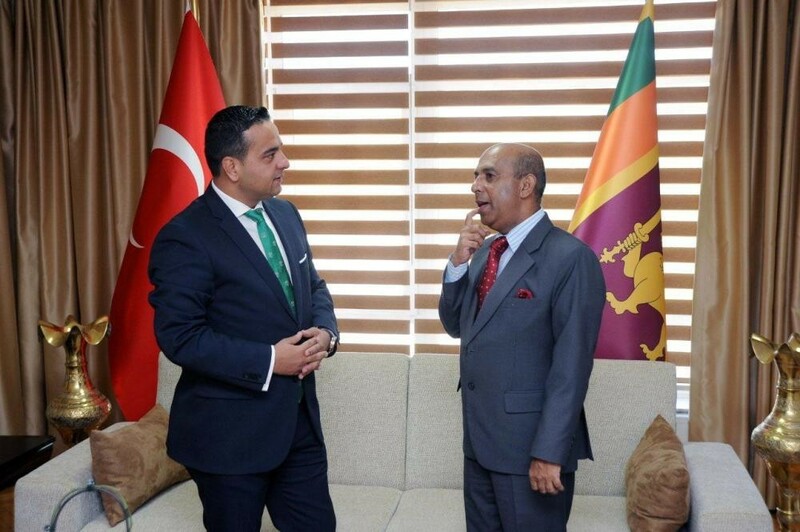 Reiterating Sri Lanka's solidarity with the government of Turkey after the Gülenist coup attempt on July 15, Ambassador Amza added that Sri Lankan-Turkish relations will flourish simultaneously with cooperation in sectors such as construction and trade. Daily Sabah's Ali Ünal (L) with Sri Lankan Ambassador Mohiden Amza. Daily Sabah: What is your view on the July 15 coup attempt? Mohideen Amza: Every country should be governed by a government democratically elected by their people. Sri Lanka joined the international community in condemnation of the recent coup attempt. My president and our prime minister issued messages in solidarity with the Turkish government in the wake of the failed attempted coup. The president of Sri Lanka, in his letter to the Turkish president, assured Sri Lanka's solidarity with the government of Turkey and has further stated that Sri Lanka condemns such undemocratic acts (military coup) that threaten the peace and security of Turkey. The prime minister's statement stating that foiling an attempt to overturn a democratically elected government through a military coup pleases all those who value democracy. DS: Terror is an important topic for both Turkey and Sri Lanka. For years, Sri Lanka fought against a separatist militant organization called the "Tamil Tigers" (LTTE) and was recently able to resolve this problem. In this regard, what could Turkey learn from the Sri Lankan experience? MA: The government of Sri Lanka has condemned in the strongest terms atrocious terrorist attacks in the recent past in Turkey and other parts of the world and called for a collective international response to combat terrorism. These heinous acts of terror have proven that terrorism is totally void of rationale, compassion and contradict all the norms, values and sentiments respected by humanity. Terrorism is terrorism, and there is no such thing as good terrorism. I am sure that Turkey will soon be able to eliminate terrorism from its soil. Sri Lanka suffered from terrorism over 30 years. As a country that suffered from terrorism for decades, Sri Lanka feels the pain and anguish that arise from such barbaric acts and could easily empathize with the sentiments of those who suffer. We fought a ruthless terrorist organization, one that was banned in over 30 countries. The LTTE were known for their barbaric acts of terror, pioneering suicide bombings using innocent children and pregnant women. The LTTE is perhaps the only terrorist organization that had the capacity and capability to launch terrorist attacks from land, sea and air. Due to false propaganda, unfortunately, some areas in the world, including Turkey, were misled into thinking that the LTTE represented the "Tamil voice." Their conduct proved over and over that is not the truth. The atrocities carried out by the LTTE began on July 27, 1975, with the assassination of Alfred Thangarajah Duraiappah, the mayor of Jaffna, an elected representative of the Tamil community who himself was a Sri Lankan Tamil lawyer and a politician. The number of killed is far too many to list them all. However, the world certainly cannot forget the assassination of the Late Hon. Lakshman Kadirgamar, the former foreign minister of Sri Lanka, who worked persistently in the international arena to have the LTTE banned as a terrorist organization. He was one amongst many renowned Tamils who were brutally killed by the LTTE. Having eradicated the LTTE's terrorism, we have come to the decisive stage of building a new Sri Lanka. We were able to defeat the LTTE militarily in 2009. Now, our quest and priority is to defeat the ideology that the LTTE had purported and win sustainable peace and harmony for our island. The three pillars on which the new Sri Lanka is being built are democracy, development and reconciliation. Having identified reconciliation as key to building a new Sri Lanka, a Secretariat for Coordinating the Reconciliation Mechanism has been established under the Office of the Prime Minister. The government is also working towards a new constitution for Sri Lanka. This constitution, while entrenching the democratic gains we achieved during the last year, will also be a celebration of Sri Lanka's diversity as a multi-ethnic, multi-religious, multi-lingual country, one that will guarantee equal rights, justice and dignity for all and address some of the issues that have plagued us ever since independence and have stood in the way of our unity as a nation. DS: Even though Turkish and Sri Lankan relations date back to the 19th century, the two countries have only recently opened respective embassies. What is the current state of diplomatic relations between the two countries? MA: You are absolutely right. Relations between Sri Lanka and Turkey could be traced over many centuries. Perhaps the foundation for this beautiful relationship was conceived given the fact that Sri Lanka, known at that time as Ceylon, was a pivotal port-of-call along the so-called Silk Road, which the Ottomans used for trading. It is said that in 1864, the Ottoman imperial authorities appointed Hassen Lebbe Marikkar as Honorary Consul for Turkey in Sri Lanka. This is supported in a book titled "Twentieth Century Impressions of Ceylon," which was published in 1907. Subsequent to Sri Lanka's regaining independence in 1948, a formal diplomatic relation between the two countries was established. The Turkish Mission in New Delhi was accredited to Sri Lanka, while the Sri Lankan Mission in Cairo was concurrently accredited to Turkey. However, when Sri Lanka opened its resident Mission in Tel Aviv, relations with Turkey were handled through that Mission until 2012 when Sri Lanka opened its resident Mission in Ankara. The following year, Turkey opened its resident Mission in Colombo. Even though the two countries are geographically distant, this did not prevent cooperation in many areas. Turkey stood by Sri Lanka during difficult times. As part of tsunami relief, Turkey built a complete village consisting of 450 houses in southern Sri Lanka. The Turkish Cooperation and Coordination Agency (TİKA) constructed 100 houses in northern Sri Lanka for those displaced by the conflict. Turkey rushed to provide assistance during the recent devastating floods. Since the beginning of 2016, Sri Lanka and Turkey have shown utmost interest in elevating existing friendly relations to new heights. In this context, both prime ministers met and held discussions in January 2016 on the sidelines of the World Economic forum in Davos, Switzerland. Subsequently in February 2016, the special envoy of the prime minister of Sri Lanka and the chairman of the Sri Lanka-Turkey Parliamentary Friendship Group visited Turkey, met and held discussions with a number of dignitaries and institutions, stressing the importance of enhancing relations in several important sectors. Turkey established the Sri Lanka Parliamentary Friendship Association early this year. DS: In June, Foreign Minister Mevlüt Cavuşoğlu visited Sri Lanka and became the first Turkish foreign minister to pay a visit to your country. What is the significance of this visit from your perspective? As part of this new found vigor to consolidate friendly relations between the two countries, the Turkish foreign minister concluded a very fruitful visit to Sri Lanka. While consolidating the pre-existing close political relations, the main focus of the visit was to enhance economic relations between the two countries. The visit further paved the way for a further expansion of cooperation in the fields of security, culture, tourism, agriculture, education and health. This visit was, as you mentioned, the first ever foreign ministerial visit from Turkey. It is indeed another significant step in further strengthening relations between Sri Lanka and Turkey, and may I add that we are now scheduling a visit by Sri Lanka's foreign minister to Turkey, following an invitation from his Turkish counterpart. There are more visits envisaged, including a visit at the highest level. The visit took place at a time when the present government of Sri Lanka is re-balancing their relations with the international community based on a spirit of openness, and while Sri Lanka is moving forward towards a new future based on democratization, reconciliation and development. 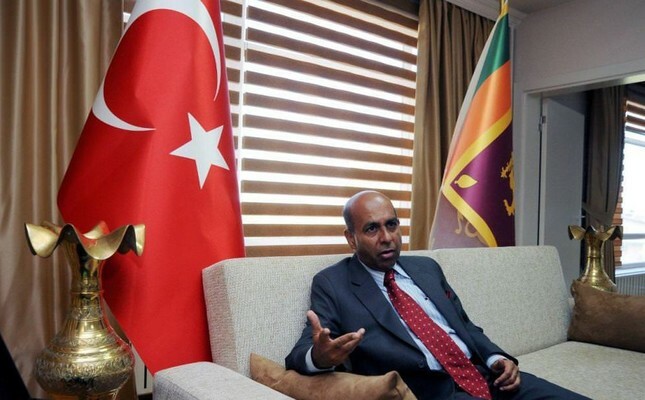 Let me underline that although this was the first time a Turkish foreign minister paid an official visit to Sri Lanka, this is not the first high-level visit between Sri Lanka and Turkey. In 2008, the Sri Lankan president undertook a two-day visit to Turkey and then-Prime Minister and current President of Turkey Recep Tayyip Erdoğan visited Sri Lanka in 2005, following the devastating tsunami. At that time, I functioned as the chief of protocol and was fortunate to have the chance to receive him at the airport. I recalled this pleasurable interaction during the discussion with President Erdoğan after the presentation of my letter of credence. DS: What are the prospects you envisage in specified sectors for the further enhancement of relations between the two countries? First of all, let me say that during this year, Sri Lanka and Turkey inked two important Memoranda of Understanding. Namely, an MoU for Cooperation on Diplomatic Training, an Exchange of Information and Documentation between the Ministry of Foreign Affairs in Sri Lanka and Ministry of Foreign Affairs in Turkey, and an MoU between the Ministry of Finance and Planning in Sri Lanka and Turkey's Export Credit Bank (Exim Bank). In addition, there are 10 more proposed bilateral instruments being negotiated, which we are very keen to conclude this year. These are based on cooperation in various fields, such as agriculture, security and defense, science, environment, disaster management, urbanization, mutual assistance in customs matters, prevention of double taxation and reciprocal promotion and protection of investments. In the cultural sector, the existing potential for cooperation is immense. Let me give you a glimpse of recent activities. Sri Lanka was one of the countries participating in EXPO 2016 in Antalya, Turkey, and June 29, 2016, was declared and celebrated as "Sri Lanka Day." The Sri Lanka National Youth Dance Troupe, consisting of 22 members, held three performances that day, giving a taste of Sri Lanka's diverse and unique aesthetic culture. Subsequently, we organized a cultural roadshow where two events took place in Ankara and another in Cappadocia. Sri Lanka understands that Turkey excels in using modern technology to prevent the menace of cybercrime and hopes to avail of Turkey's assistance in this sector to curb this grave issue. Sri Lanka is a country proud of its history and which strives hard to preserve what remains from our journey through history. In this aspect, Sri Lanka could certainly use Turkey's expertise in archaeology and museology. Sri Lankan students have recently discovered Turkey as a destination for higher education. Turkey offers a number of postgraduate scholarships in different fields to Sri Lankan students. In coming years, these numbers are expected to increase.